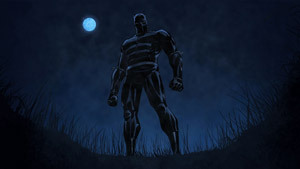 Marvel Knights Animation is proud to announce BLACK PANTHER: WHO IS THE BLACK PANTHER?, a 12-episode, weekly, all-new series debuting on iTunes, Xbox LIVE, Microsoft Zune and PlayStation®Network on June 23rd. 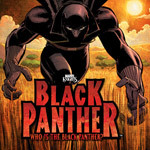 Inspired by the acclaimed graphic novel from respected filmmaker/producer Reginald Hudlin and legendary comic book artist John Romita Jr, BLACK PANTHER: WHO IS THE BLACK PANTHER? introduces viewers to the Black Panther, the warrior king of Wakanda, a technologically advanced nation in the heart of Africa. As outside forces conspire to plunder this proud nation, the Black Panther will face his greatest threats as he meets Klaw, the man who murdered his father. 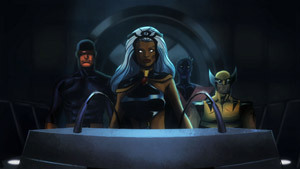 This exciting series also features the voices of major celebrities including Academy Award-nominee Djimon Hounsou as Black Panther; Jill Scott as Storm, Kerry Washington as Princess Shuri; Alfre Woodard as both Dondi Reese and Queen Mother; Carl Lumbly as Uncle S’Yan; and comics legend Stan Lee in a special role. We have been hearing about the release of a Black Panther animated series for a long time, but for whatever reason, delays have kept Reggie Hudlin, the Executive Producer on the series, from being able to release the show in the United States. You may have seen the clips of the cartoon, however, on Youtube as it had been released in Australia earlier last year. Well, if you are a Black Panther fan and had been looking forward to the release of the series, then you will be happy to hear that it has officially hit the iTunes store. Here, you can purchase all twelve episodes for $1.99 each, which is not bad considering it costs less than a comic. I caught up with Reggie to talk about the release of the series and why he chose to do it through iTunes rather than through BET, as was initially planned. Comicvine: Last year at SDCC you previewed the animated BP series during the Black Panel. Is this the same series we saw last summer? Reggie Hudlin: Yes, it is. CV: Many fans of Black Panther’s character have been waiting years for the release of the show, and over a year ago it had been rumored that the series would be televised on BET. What happened to that deal? RH: The broadcast of the show is still being negotiated. In the mean time, we wanted to public to see it, so given Marvel’s success in this platform, we decide to try this approach. CV: First, why iTunes? And are you excited about the web release of the show? Do you think that iTunes will reach a wider audience/demographic? RH: Well, it’s an experiment. The Black Panther has always had a way more diverse readership than most comics, and I don’t just mean racially. So it could be a good way to connect to folks who would love the story but have no idea where a comic book store is. The challenge is making them aware that it’s there to check out. CV: The style of animation is very different and is somewhere in a cross between animation and motion comics. How is this show different? Can you tell us a little bit about the creative process? RH: It was a real collaboration between, myself, Denys Cowan and the amazing team at titmouse. We added material, we cut material, we did a lot of experimentation with what would work from the original art once it was put in flash. Sometimes we would be mad frustrated, sometimes we would be very pleased with ourselves. But the point was to do this at a relatively low cost so we could do a show that maintained the integrity of the comic book. The Black Panther storylines that sold the best, that seem to have the most enduring resonance, are the ones with a heavy political subtext. That’s logical, given that the character is a world leader and the symbolism of his title. Most animated shows are either for children, or are comedies about families. The Black Panther is neither. The only reason I did the comic was to tell the story as I felt it should be told, and the result was the most popular version of the character. Through a very unusual set of circumstances I was able to produce this series and maintain that tone and integrity. CV: How much of what we will see in this series is derived from the comic books? RH: The bulk of it is from the WHO IS THE BLACK PANTHER storyline, my first six issues of Black Panther. But I also incorporated some elements of Eric Jerome Dickey’s STORM storyline, and wrote some original material as well.